Rain during a backpacking trip can be absolutely wonderful and even romantic. But there is quite the difference when the rain falls… indoors. 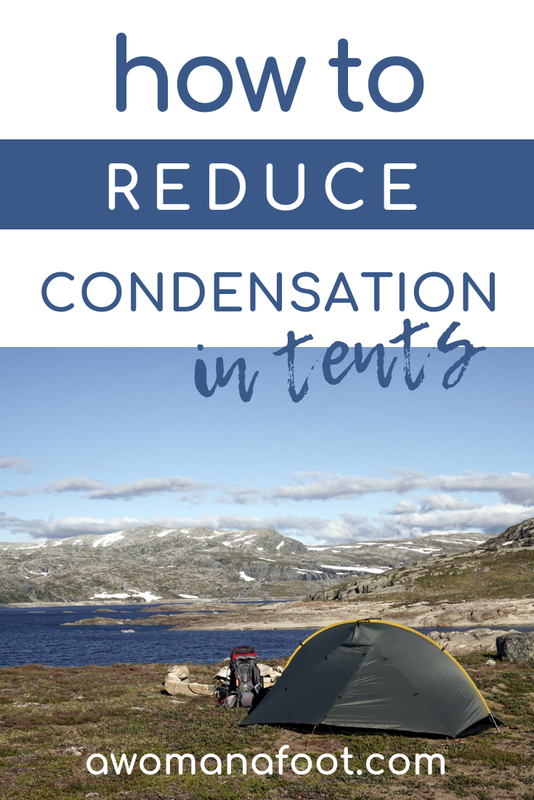 Condensation is a quite common and pretty annoying problem while backpacking. Instead of trying to fight against the laws of physics, it’s worth learning a few tips and hacks to minimize the inevitable. What are the causes of condensation? First of all – what is condensation? It’s a pretty straight-forward physical reaction to the changes in temperatures with moisture involved. The walls of our shelters are the barrier between us and the world outside. We produce body heat and we exhale about one liter of water throughout the night. When the temperature outside is colder than on the inside, and there is moisture present in the tent, liquefaction occurs. We can’t really avoid the issue. It’s more about understanding it and playing along. What can make condensation worse? close proximity to water - lakes, ponds, etc. So what can you do to minimize the dreaded effect? First of all, we can choose our pitching spot carefully. The more moisture there is around the more condensation on our tent’s walls. Find a place that is semi-open – no deep shade from towering mountains or rocks. It might be a good idea to pitch under the trees, though - just watch out for widow makers - old, dry tree branches. Trees also keep the day’s warmth a bit more than a complete open field. Avoid hollow spots where water can gather and the air is colder. Pick a place where there is some wind or breeze. Don’t hide completely between rocks or some structures. Pitch your tent away from water sources - rivers, ponds, lakes, etc. The next thing is to pitch your tent correctly. Check what the wind direction is and place your tent such that there is air flow through the tent (if there is only gentle breeze - directly into the front). This will also avoid making your tent into a sail or a balloon. Open your air vents up and unless it’s raining heavily. It might be tempting to shut the tent as much as possible on a cold evening but it’s not a good idea. To avoid being cold pack proper clothes and a warm sleeping bag but open the vents or lift fly sheet for proper air circulation. Lift or open flysheet up to provide good air circulation. If there is no rain the forecast – you might try sleeping only with the bug net although I had condensation gathering on it, so nothing’s perfect. If you have a double-walled tent, make sure you stretch the fly sheet well so it does not touch the inner tent. If you have any wet or damp clothes or gear – don’t bring them into the tent but rather try storing them outside and under the fly sheet. If it’s not possible, you may stuff them into a dry sack. If they are just slightly damp – you may try to stuff them into your sleeping bag, they should be dry by the morning. When the weather is nasty or cold outside it may seem like a good idea to boil your water inside the tent. That’s a bad idea for a few reasons: first, you may get poisoned by the carbon monoxide. Second, all the steam and heat will cause some serious condensation. So what can you do? Cook outside unless it’s raining. If it’s windy – build a wind cover for your gas cooker. Use rocks, your seating pad, etc. If it’s really nasty, cook under your fly sheet but as far from the tent opening as possible. Make sure there is proper air circulation to get the fumes and moisture away. When you cook food outside, don’t bring the meal inside to eat. Same with steaming tea or coffee. I understand how wonderful a hot cup of tea might be in the evening - put a lead over it and drink in insulated mugs, which will minimize the steam or heat warming up the indoor air too much. It might be that no matter what we do, there is still some condensation. There are a few good habits that can help you protect your gear from all that moisture. I sleep in down sleeping bag no matter the weather. It’s light and warm but very delicate – down is not working well when wet. So I need to take extra care to protect it. When I hike I have it stuffed in a high-quality dry sack. When I’m in the tent, I do all I can to make sure I don’t touch the walls with it. I sleep in a two person tent so I have more room. I generally don’t sleep right at the edge but a bit more to the center. As the tent is much longer than my height, I put my backpack at my feet so I block my way to the edges. At the head there is no risk getting too close, it’s about the feet area that could be an issue. Another way to ensure a dry sleep is to use synthetic sleeping bag or hydrophobic down. Some producers make sleeping bag using waterproof fabrics. You just need to know that it’s a trade-off - they tend to be heavier and less breathable. In the morning, when you need get moving, it’s easy to hit the tent’s walls and cause a real rain falling down. It’s worth paying extra attention so it does not happen – especially when your down sleeping bag is still around. Don’t waive your arms too much and you should be fine. Also – don’t shake your tent too much when you go out to pee in the morning! Sometimes you might be lucky and there is a nice and warm sunshine right from early on. But quite often the mornings are slow and damp. In addition to the condensation you might have the extra problem of dew and no warm breeze to take care of it. I always carry a small towel or sponge with me. I found that the best ones are the kind of square thin sponges that absorb a lot of water and dry hard. But other kinds of well-absorbing towels will work fine. When you remove all your gear from the tent, simply dry the walls as much as you can. The moment there are no big drops, the air and sun rays dry the fabric pretty fast. If you have a double-walled tent and the ground around you is dry, you may turn it upside down and let it dry a bit. When I do that step, even when the tent isn’t completely dry, I don’t care all that much. When I pitch it the next evening, it doesn’t really matter if it’s a little bit damp – it should dry pretty fast. If the tent is really wet (like when I had to pack it during heavy rain) I just try to pitch the tent early enough so there is time for it to dry before I hit the sleeping bag. If you have a chance to stop during the day on a nice, sunny spot – take the tent out and dry it. If the sleeping bag got a bit wet – do the same. Down sleeping bag needs drying/airing whenever it can get it. Any good tips to share with the class?